Mary E. Pearson on Mary E. Pearson: "I've been writing full time for about ten years now. I just sent my fifth novel off to my editor, and my fourth comes out this month. "On a personal level, I have been married to the man of my dreams since I was a tot and have two beautiful daughters who both tower over me. My husband's tall genes are obviously much stronger than my short ones. "We also have two golden retrievers who I do tower over, but they tend to rule the roost anyway. They're too darn sweet and cute to ever say no to them. I am an easy touch." I was very quiet. Of course with my small group of friends I could be loud and crazy, but in general, I was one of those on the perimeter who quietly "watched." I didn't belong to any one specific group, but for the most part I hung out with the surfer crowd because my girlfriends and I surfed. But I also had cheerleader friends and jock friends and low-rider friends and band friends--you name it. Even though we had labels when I was in high school, I think you could flow from one group to another a little easier. It was the "hippie" period, and that label almost covered everyone. At least all of our parents thought if you had long hair and wore beads (this was the '70s) that you were part of some hippie subculture. And I did have straight hair past my waist and always had leather beaded bracelets on my wrists and ankles. Oh, and I went bra-less. Can I say that? My parents definitely thought I was just this side of joining a commune. Beginnings. I love teen protagonists because they are making serious adult decisions, but it is pristine territory. It is not like it's their hundredth time of getting out of rehab or their eighth divorce. They are encountering a lot of firsts in a very important, life-altering way. I like exploring that territory. Ha! Lots of stumbles. The first stumble came when I was in college, and my professors told me all I would ever be able to do with an English degree is be a teacher. I wanted to be a writer, and just being out of high school, a teacher was the last thing I wanted to be! So I went with my alternate choice: art. If I couldn't be a writer I would be an artist. Very practical, huh? Youth. So that set me back about twenty years--that and being a mother, teacher (turns out I loved teaching after all), and everything else in between. But in retrospect, I think the detour turned out to be a good thing because I am not sure I would have been able to handle the real "stumbles" of this business at such a young age. That old rhinoceros-skin thing you have to develop, you know? And of course the various life experiences helped to give me a lot of perspective, too. So I really think I became a writer when the timing was right for me. The sprint came when I sold my first book. Of course it didn't seem like a sprint at the time, but relatively speaking, the time from submitting my first manuscript to selling one was only a little over a year. And I've had stumbles and sprints ever since. It's part of the writing world. One thing for sure, it's never boring. We last spoke in May 2005, shortly after the publication of A Room on Lorelei Street (Henry Holt, 2005). What has that book come to mean to you over time? I love Zoe. I always will. Her story taught me a lot about writing honestly. And the many readers who have written to me and shared their thoughts--all those letter make me so grateful to be a writer. I am amazed at how many people told me that Zoe's story was their story, too. We read to escape, but we also read to see ourselves. I am grateful to be part of that process. How have you grown as a writer since you began working on your craft in a serious way? I think with each book I am learning to dig deeper. With A Room on Lorelei Street especially, I think I learned to banish my internal editors and just write the story that was speaking to me--the one I wanted to write--and write it as honestly as I could, even if it was painful at times. And of course I'm always striving to make my vision match my execution. It's not just a matter of saying what you want to say, but creating the atmosphere and feelings of the world you want to share with others. But at least half of what happens in the writing process seems to happen subconsciously anyway--those fun surprising things that don't even seem to come from your own head--so growing for me also means just trusting the process. I think what is frustrating is that sometimes I want the story to come now, but that just doesn't happen. It comes when it's ready, in fits and spurts. My editor has been awesome that way, telling me the story will be done when it's done. That really gives me a lot of freedom to listen. 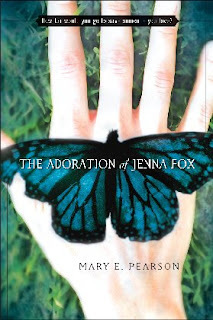 Congratulations on the release of The Adoration of Jenna Fox (Henry Holt, 2008)! Could you tell us a bit about it? It's a near-future story about Jenna Fox who wakes from a coma and can't remember who she is or the accident that took away her memory. She lives with her family but can't remember them either. There is something odd and curious about the whole situation, and piece by piece, she puts the clues together. The heart of the story is about finding identity and how we define humanity and its value. Two questions fueled the story. How far will medicine advance in fifty years? And, how far would a parent go to save their child? I asked myself both of these questions when my own daughter was diagnosed with cancer, and I witnessed not just what we went through, but what other parents with hospitalized children were going through and the tough decisions they had to face. Luckily, my daughter had a choice of treatment with a good success rate. Just fifty years earlier she would have died of this cancer. I was infinitely grateful for the time and place we lived. Of course, I didn't know that these questions would be the impetus for a story years later, but they niggled at me long after my daughter was well. When my second daughter was diagnosed with the same illness 3/4 of the way through writing this story, it at first turned my world upside down as it would any parent, but then, I think, deepened the story--especially the secondary characters. Well, there was one major obstacle when I began this book. It was something that I hadn't even considered. How do you get to know a character who doesn't even know herself? I was banging my head against a wall just a short way in, thinking, how do I write about a character who has so many gaps? What have I taken on?! Jenna had no point of references or very few. All of our world perspectives are built on prior experiences and yet she had none. I really had to shift gears and be prepared to experience her world as it came and Jenna slowly developed her new identity. As for research--that was fun and ongoing. I loved reading about the brain, brain damage, language acquisition, and all the different control centers and what they do. But the interesting thing is the mind. The mind and the brain almost seem to be two different entities. There is still so much we don't know. It's like it is the last frontier. And of course, lots of other research popped up along the way as different characters and situations presented themselves. Prosthetics are making amazing advances. Sometimes I felt like my imagination was barely staying ahead of reality. And just recently we have been hearing about seed vaults in the news, and seed preservation was a passion of Jenna's grandmother. I just recently sent off the completed draft of my next book to my editor. The title isn't settled yet, though my editor and I do have a favorite that we are wild about, but it is a little "different" so we are letting it simmer a while. Titles are so hard, but this one jumped at me during one particularly head-banging moment and I thought, yes! Perfect! Anyway, it's about four teens from a boarding school who set out on an "unauthorized" road trip. The story explores the ways chance weaves in and out of our lives. Kind of a fun, outrageous, quirky, and hopefully thought-provoking sort of story. It should be out in 2009.